Gozo, a Hidden Mediterranean Gem with a Lot of Heart. I have driven by this neighborhood watering hole many times but never took notice of it because they didn’t have a sign. 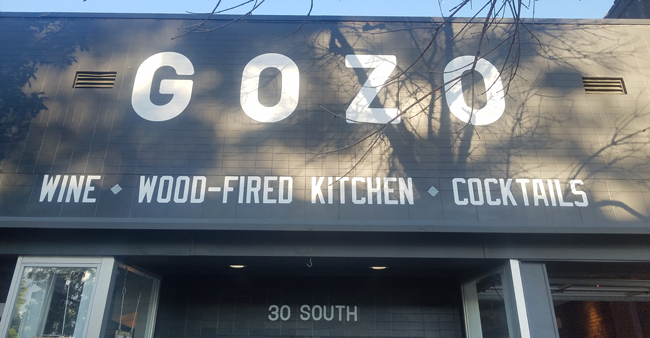 Recently, the folks at Gozo have simply painted on the brick at 30 South Broadway, “Gozo” and underneath, painted “wine, wood-fired kitchen, cocktails.” In my experience, this cleverly unassuming sign conveys that this little bistro is going to be unpretentious. My expectations were not lofty due to no famous chef and no hordes of hipsters when I walked in, but I was about to have my mind changed. The first thing you notice is the sight and smell of the centerpiece of the kitchen, a wood-burning oven and a chic, industrial decor with exposed brick and wood floors. I immediately felt comfortable and knew this was going to be a restaurant that I could go to for any occasion, dressy or casual. The clientele seemed like locals of the Baker neighborhood and ran the gamut from young to old. I sat by the open garage doors looking out to the colorful sights and sounds of Broadway, taking in the calm September evening, and I could see the sunset over the mountains -- my favorite time of day. The menu is very simple and doesn’t break the bank. It’s broken up into three sections: small plates, which weren’t so small, large plates and pizza. My friendly and accommodating server, Jennifer, recommended a glass of Campos de Luz Rosé from Spain which was an excellent suggestion to start the meal with and paired perfectly with the house-made Burrata. 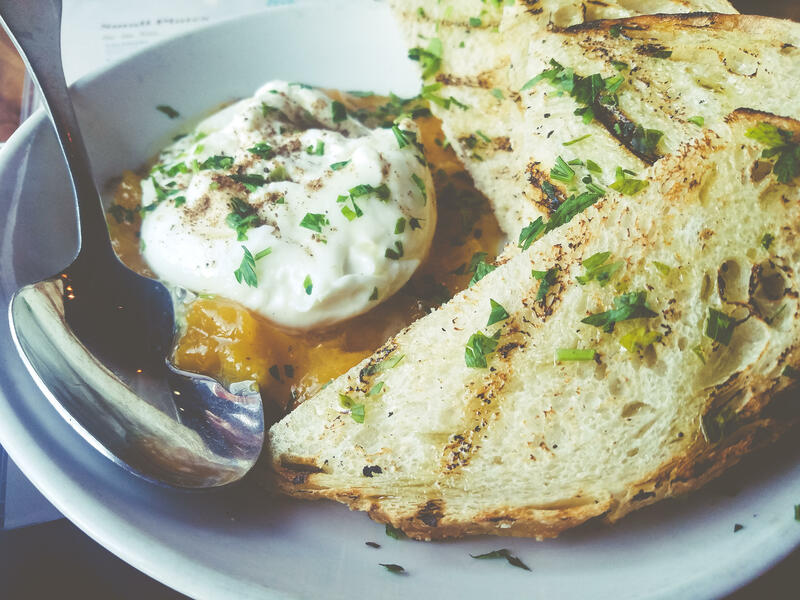 The burrata had the usual creaminess you would expect served with toasted bread, but the rosemary-apple marmalade was a wonder. I then had the much-lauded octopus which was served with braised potato, pickled onion, and a delicious salsa verde. The octopus was perfectly grilled and oh-so-tender. I had to ask my server how they prepared it and she told me they poached it first in white wine and lemon juice. Next, in what in other kitchen’s hands would be considered pedestrian, was baby carrots served with crispy chickpeas and a tahini hummus, a surprising revelation. I was having so much fun trying the small plates, I wanted to try everything in that section, but alas, time for some big plates. I ordered the roasted chicken and Jennifer brought me a glass of Grenache which was a perfect complement to the absurdly crispy skin on the free-range thigh with housemade pappardelle pasta, roasted mushrooms, and baby spinach. Although I was feeling full, I just had to try one of their pizzas. It seems like one was brought out to every table this evening. I’m a sucker for arugula on my pizza and theirs didn’t disappoint. Cooked in their 800-degree oven, the crust was thin, crispy and chewy and topped with prosciutto, mozzarella, and the aforementioned arugula. Someone in the kitchen at Gozo truly knows what they’re doing and you can taste it. Every dish was perfectly executed and well thought out. Don’t miss this restaurant for your next lunch or dinner. You can eat there for 20 percent off your total bill this month if you get the Feast Locally card, as I did! Use promo code DENVERNOW to save $10 off membership. Have you been to Gozo before? If so, what did you think? Let us know in the comments below. Check out these 7 hilarious cake messages that'll make 'em feel extra special!